Do you have those friends who love to go fast, climb hills and ride all day long? 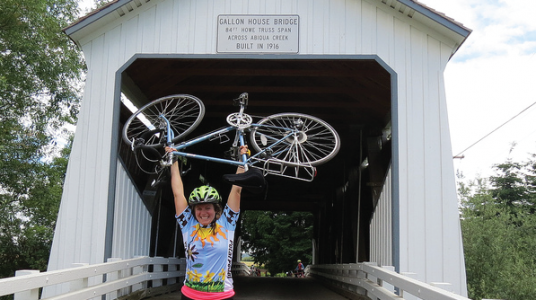 Do you have those friends who are new to riding and are curious (and maybe nervous) about riding more than 10 miles? It may sound too good to be true, but we have the perfect ride for you. We’re huge fans of Petal Pedal, a gorgeous ride that takes place in the Willamette Valley every June. 30, 50, 70, 100 miles. Those are your options. Which one should you select? Well, we certainly recommend you select the 100 if you want some climbing and the “full experience” as it includes a gorgeous climb up to Silver Falls State Park, home to striking waterfalls. All of the routes are stunning and serene as they traverse low-traffic farm roads. You’ll go miles without seeing a car. You’ll probably even see more tractors than cars for most of the time. The 30 mile route is very approachable. Combined with the top-notch support Petal Pedal offers its riders, this is a fantastic way for someone new to riding to get started on a distance ride. You really can’t go wrong with any of these routes. This is one of the best rides out there. Here’s the bonus! The way the courses are laid out is rather ingenious: you may switch your route at any time! If you’re feeling stronger, go bigger. If you’re not feeling up to a big ride, dial it back a notch! The only aspect to be aware of is that each course has support designed to be in place during the time it would take both a fast and a relaxed ride to complete that course. If you pop onto a course early or late, that support may not be as robust. Whichever course you choose, enjoy the ride! Cruise past blooming fields of flowers, breath in the country air and relax with hundreds of your new best riding buddies. Pedal Petal is for everyone! You can find out more about the ride on their website. PRO TIP: Save $5 when you use code ORBIKE-EBA18 during online registration.